Rocket League is a super popular game and it is on a variety of gaming platforms, like PC and consoles, but if you’re looking for a new way of enjoying the game, you’ll be happy to learn that Hot Wheels has announced a real-life Rocket League game. We’re talking RC cars that let players do battle in real-life. 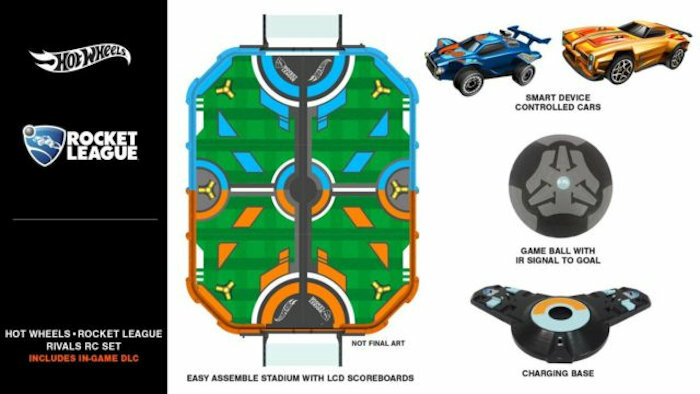 It comes with ‘Octane’ and ‘Dominus’ remote-controlled cars, a Rocket League ball, and a custom field mat that looks like it’s straight out of the video game. Both cars are controlled via Bluetooth from your smartphone or tablet with no extra controllers needed. The vehicles and ball are charged with a large boost pad station and the set’s scoreboard will track any shots that go through the goal automatically with sounds. The game will also come with codes that players can use to redeem in-game items. It doesn’t come cheap at $180 though. There’s no date for release just yet, but Hot Wheels is expected to show it off at the Toy Fair in New York City which takes place from the 17-20 February. So you can see it there if you are going to be at the show. This should be fun for fans.